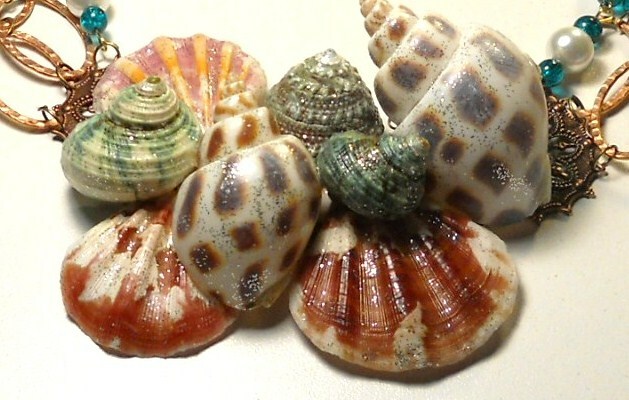 Beautiful Shell On The Sand Ensemble, includes a 19″ Necklace, 7.5″ Bracelet (standard size), and 2″ Long Earrings. This three-piece set is made with Ox Gold Findings, Toggle Clasps, Hook Earwires, Flower Station (behind shell pendant and on earrings), Tan & Pale Pink Crystal Beads, Splash Painted Copper Crystal Oval Beads, and an Ice Resin, Natural Sea Shell Pendant. Another Designer Original from Jewels Designs, Sun, Sand & Sea Jewelry Line. Makes a fantastic gift, or buy it for yourself. Would be a great addition to your wardrobe. Wear with a beautiful flowing dress or to the beach. This ensemble has been drastically reduced to make room for our new stock! Check out this set and all of out other art designs at Jewels Designs. One-of-a-kind. Beautiful & Bold describe this two-piece set. Avocado Ensemble includes a 18″ Necklace and a 3″ long Pair of Earrings. This Ensemble is made with Ox Copper Findings, Round Connectors, Engraved Bead Charms, Hook Earwires, and Toggle Clasp. The set is topped off with Avocado Green Leaf Drops, and Black Jet Beads. Another Designer Original from Jewels Designs, Bold & Beautiful Jewelry Line. If you looking for a stand-out piece of art then this is the piece for you! Check out this set and all of our other art pieces at Jewels Designs. Beautiful & Elegant, Filigree Bracelet is 7.5″ long (standard size), and made with Sterling Silver Filigree Oval, Round and Spiral Connectors, Findings, Chains and Toggle Clasp. Antique Inspired Another Designer Original from Jewels Designs, Gift Gallery, Bracelet Shop. This piece can be worn with any of your outfits and is a one-of-a-kind bracelet. Makes a fantastic gift! Check out this piece and all of our other art creations at Jewels Designs. I chose this necklace today because It’s My Birthday and It’s My Favorite! Madame Rowdy Kate Necklace is 20″ long and made with Silver Findings, Chains, Watch Parts, Wheel Cog Connectors, Propeller, Assorted Charms, Roses (green, pink, gold & turquoise), Gunmetal Toggle Clasp Gold Opal Bead, and a Black & White Lady Cameo Locket. Madame Rowdy Kate is another Designer Original from Jewels Designs, Madame Steampunk Jewelry Line. If you’re looking for an accessory a little on the edgy side then this is the piece for you! Check out this necklace and all of our other art pieces at Jewels Designs. One-of-a-kind. This is a Brand New Set, from our New Shop, The Copper & More Shop. The Necklace is 16″ long and the Earrings (sold separately) are 2.5″long. The Set is made with Antique Copper Findings, Flower Toggle Clasp, Flower Beadcaps, Hook Earwires, Flower Connectors (earrings), Swarvoski Crystal (earrings), Shiny Copper Beads, and Peach/Pink Shell Flowers. This is another Designer Original from Jewels Designs, The Copper & More Shop. The set just makes you think (and wish) for Spring:-) Wear it will all your Spring & Summer Outfits! One-of-a-kind Set. Makes a fantastic gift! Check out this set and all of our new art pieces at Jewels Designs. Beautiful Petals In Winter Necklace, is 18″ long and made with Copper Findings, Chains, Victorian Antique Pendant Back, an Abundance of Gold-Filled Wire Wrap Curls, Hear Toggle Clasp, Freshwater Potato Pearls and Ruby Swarvoski Crystal Beads and to finish off the entire piece I added an Intaglio Rose Cabochon. A very wearable art piece and a Designer Original from Jewels Designs, Pretty Jewels Line. This piece can be dressed up or down and it would make a fantastic gift! Check out this piece and all of our other designer pieces at Jewels Designs. One-of-a-kind necklace. 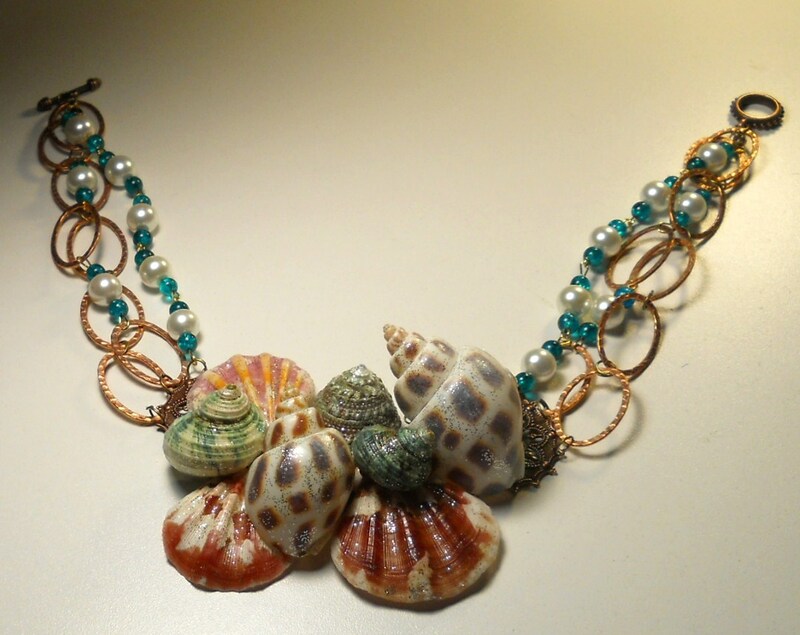 Beautiful Oysters In the Sea Necklace, is a 17″ long Designer Piece, made with: Copper Findings, Oval Connectors, Toggle Clasp, Antique Copper Stations (back of shell cluster), White Pearls, and Aquamarine Swarvoski Crystal Beads. The Shell Centerpiece is 4″ wide and seal coated with Ice Resin, this helps protect the shells from cracking. Another Designer Original from Jewels Designs Sun, San, & Sea Jewelry Line. This is a one-of-a-kind piece that would make a great gift. Would look fantastic with all your summer outfits. If you’re going on a cruise this would be a prefect addition to your vacation wardrobe. Check out this piece and all of our other art pieces at Jewels Designs.